Home NEWS Leaders ‘unearth’ the courts plot to destabilise the country. Leaders ‘unearth’ the courts plot to destabilise the country. Kangema MP Muturi Kigano (left) addressing voters from his constituency where the leaders blamed the judiciary for the current stalemate. With him is his counterpart from Kiharu Hon. Ndindi Nyoro. Seven Murang’a MPs have rubbished the judiciary for their inability to contain NASA supporters and encouraging them to disobey law and order. 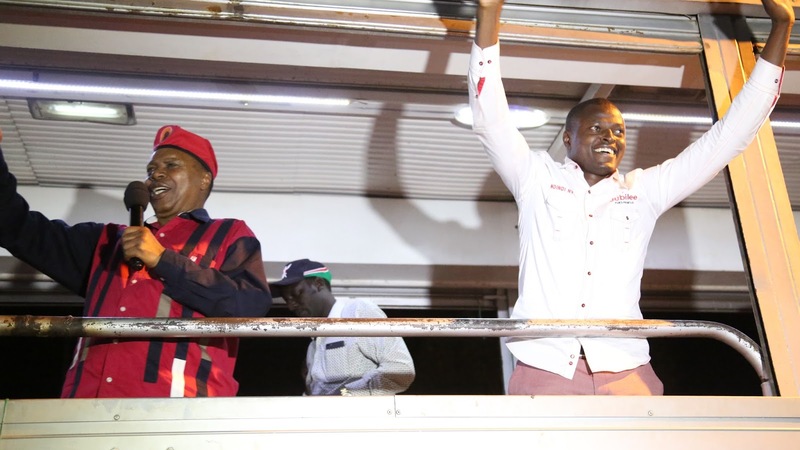 While campaigning for President Uhuru Kenyatta across Kangema Constituency, the leaders wondered how the judiciary allowed itself to be manipulated by the opposition to disregard the rights of other Kenyans. Citing the numerous cases that have been lodged in different courts to halt particular government and police directives were crippling law and order and encouraging people to disobey the law. “The judiciary is to blame for all the problems that are facing this nation because they are working in cahoots with Raila Odinga. The ban on Anti-IEBC demonstrations within the CBD by Acting Interior Cabinet Secretary Fred Matiang’i was meant to protect people’s lives and property. So, when a judge lifts such a ban one wonders what logic they are using,” pointed out Kangema MP Senior Counsel Muturi Kigano. Kigano suggested that the ICC to apprehend Raila Odinga for spearheading destruction of people’s property, events that have resulted to loss of lives. Kandara MP Alice Wahome, who is also a lawyer by profession, lamented the fact that the courts had not yet realised the mess they were causing this nation pointing out the ripple effect of their action may be experienced years to come. She called for reforms in the judiciary immediately after the election so as to tighten all the loose ends in that arm of government. Wahome distanced herself from calls for dialogue between Jubilee Party and NASA, condemning former Justice Minister Martha Karua, former Kiambu governor William Kabogo and former Mukurwe ini MP Kabando Kabando for ‘betraying’ the nation. These sentiments were supported by Maragua MP Mary Waithira and Gatanga MP Eng. Joseph Nduati who called for a complete overhaul of the judiciary. Kigumo MP Ruth Wangari Mwaniki was disappointed by Raila’s action of ‘washing the country’s dirty linen abroad’ for his own selfish gain. Mathioya MP Peter Kimari blamed the courts for the current stalemate in the country adding that the aim of the persistent demonstrations was to sabotage the economy and perpetrate looting with the aim of erupting into full blown chaos. Kiharu MP Ndindi Nyoro vowed that the MPs will not relent in protecting businesses most of which are owned by people from Murang’a. The leaders who traversed the constituency urging voters to come out in large numbers on 26th October to vote for the president.